Enjoy the ambiance of a crackling fire without hauling wood. 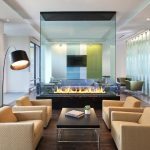 Acucraft’s custom gas fireplaces are the ideal addition to any space providing warmth, beauty, and style. Choose from our most popular Linear Gas Fireplace models below. Add modern elegance to any space with an Acucraft Custom Gas Linear Fireplace. Choose from Corner, Panoramic, Peninsula, See-Through, or Single-Sided Gas Fireplaces. For when you want something truly unique. Add a stunning centerpiece to any home or commercial space. Enjoy traditional modern sophistication & ease of operation. Dramatic & distinctive, Acucraft’s Circular Custom Gas Fireplaces provide extraordinary elegance. Unobstructed views & show-stopping style – an Acucraft Custom Gas Four-Sided Fireplace will not disappoint! y log home company recommended Acucraft Fireplaces and I am so thankful they did. I purchased their see-through and a single-sided fireplace. Building my home took a lot of planning and Acucraft employees were so great to work with. They work with the drafting department to get the fireplace dimensions spec’ed into my plans, the local builder inspector, my builder and my mason. They even coordinated the delivery of my fireplaces to arrive the same day as my logs. Thank you Acucraft for all your assistance, my wife and I really enjoy our fireplaces. The fireplaces are the focal point of our home; keep your eyes open our home is being featured by a log home magazine."